Reviews of Our World is Burning. Here is a sample of early reviews that were quite humbling. The critics liked the authentic tapestry I was creating. Dr. Ian Prattis is a visionary and leader in the world of engaged Buddhism. This book reads like an invitation. Ian provides what we need in troubled times – clear guidance, practical steps to take, and a warm and open hand in a world that so many fear is becoming too cold and distant. Ian’s writing gifts us with the impossibly perfect teachings of interconnection and heart opening. In this book, Ian makes an excellent contribution to existing commentary on world change and inspires action through the wisdom of his engaging story-telling. Dr. Prattis has been a voice, a teacher, a passionate advocate for the earth and all her species for decades and long before the word eco-dharma entered our vocabulary. His books transcend time and space. Ian Prattis was at the forefront of awakening to the threat that climate change posed to our home and our mother – the Earth. Ian’s books are a creative, imaginative read as we struggle to find a new paradigm for our culture – away from rampant, unfettered consumerism and global corporate oligarchies demanding ever increasing short term profits at the expense of earth and all her species. Prattis leads the way in this collection of essays. Ian’s essays on mindful engagement are an overview of a lifetime’s work that started with a younger version of himself and a goal of saving the world. Through his books Redemption, Trailing Sky Six Feathers, and New Planet, New World readers saw glimpses of the man and his message both evolving and growing to new levels of spiritual understanding. At a time on earth when hope is badly needed, Ian’s essays have universal appeal, assuring us that a better world is possible and that each of us must contribute to its creation. 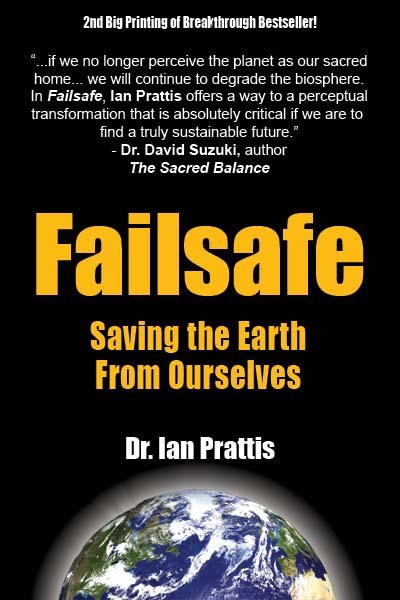 Dr. Ian Prattis, with the vision of a Prophet, the heart of a Buddha and the mind of a master Story Teller, offers a timely gift to humanity as our poisoned collective psyche, reflected in the deterioration of our ecosystem, is poised to burn on the pyre of global consumption…. In the midst of it all… a Teacher has come… Now, pick up a copy of Our World is Burning and watch evil leave the room. On Thursday November 17 I was interviewed on Rogers TV Daytime Ottawa about my latest book – New Planet, New World. It is the final bookend of a trilogy – “Chronicles of Awakening.” Redemption is the first book in this trilogy that has Trailing Sky Six Feathers as the second book. The final tome of this trilogy takes characters from the prior two books, placing them in the future on a new planet. I place in the mouth of Dr. Tom Hagen a blistering rant to the UN in 2080 that I would certainly like to give from the future. It is about the willful ignorance displayed by corporate and government cabals invested in the carbon/oil complex, while eco militias murder in the streets and social disorder is a norm. I talked about how time, culture, space and consciousness are fused across centuries. This action packed book of intertwining plotlines arc into the epiphany of the final chapter – the end game of a philosophy for the future. The inclusiveness of science combines with Tolstoy’s vision, Pope Francis’ Climate Change Encyclical and not repeating the mistakes of the carbon cabal. The underlying message is from Tolstoy, the ‘Conscience of Humanity.’ He described humanity’s bottom line as the cultivation of love, the mainspring for authentic and responsible living. This final chapter – Musings On the Future of Humanity – was written long before Trump ascended to the presidency in America. However, readers pointed out that I had provided an antidote for all that Trump intends to implement. Anticipate and harken to the rip tides of this futuristic novel. If rampant consumption is the deepest desire then we have a degraded planet. Valentine’s Day, Easter, Christmas – these special days are targeted by the captains of industry for optimal retail returns, and in the process mindless consumerism is fuelled to the max. At Christmas time we are far removed from remembering the significance of this spiritual celebration. Christmas products created by fossil fuel energy feeds consumerism and consumerism fuels Global Warming. The chain of interconnection is clear. Whether it is holidays, housing, transport, gifts and so on, our consumption requires the continuous use of fossil fuels. The mantra of western civilization – endless economic growth – provides a promise of expectations being met without any awareness of consequences for either our own health or the health of the planet. It is becoming clearer with every passing day that our current non-sustainable energy and economic systems are actually subsystems of a global ecology that is disintegrating before our very eyes. Yet even those few policy makers who recognize this, rush to find energy alternatives to fossil fuels without addressing the root causes of rampant consumerism – the major behavioral manifestation of western industrial civilization. Biofuels are not the answer, as their production will destroy ecosystems rather than replenish them. New energy technology is certainly needed, but if placed within the existing paradigm of current values and consumption habits then the same vicious downward spiral of environmental degradation would occur. Until such time as the underlying causes of rampant consumerism have been understood and changed. Consumerist addiction and craving, fostered to keep the wheels of industry turning, can take over our entire life with disastrous consequences. It is a state of consumption wherein we cannot be happy without the object of our cravings. We are then driven to search for, strive and even fight to obtain that “something” we crave. This makes us suffer all our lives, as we are never happy or present with what we get or achieve, as there is always that “want” for more. We need the insight that this kind of consumption is in fact the obstacle to true happiness, for we also have within us the capacity to “be”, to live fully in the present moment. Yet these capacities are obscured and covered up by habit energies, by acquired and inherited addictions. We must be prepared to release these obstacles rather than feed off and be held captive by them. We stop this process by meditating and looking deeply into the driving force of our deep desires. Then create an opportunity to transform them. Instead of lust, greed and fame we foster the desire to awaken at the highest level – to experience joy and happiness in the here and now – the desire to bring loving kindness to everything we connect with and the desire to alleviate all suffering. Just as addictive consumption provides food for our consciousness, the desire to awaken and be present is also a food for our consciousness.